Updated Version of this Costume! After I made my first atempt at convention cosplay as a Bubblehead Nurse, a broke Avi decided to make another nurse costume without a mask. 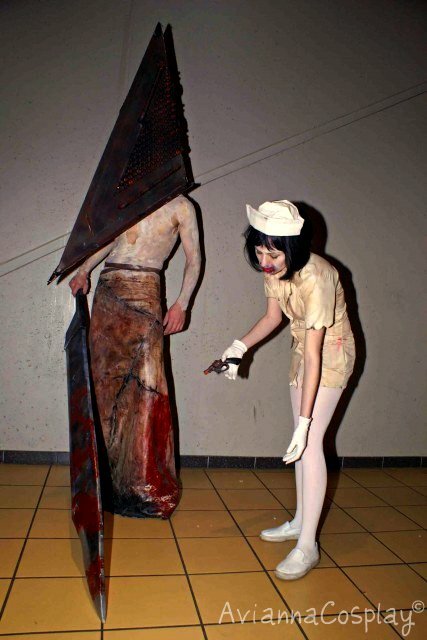 And since I’m a huge fan of Silent Hill, another nurse with the same dress. Oh the simpler times when I didn’t care so much about accuracy. I keep this costume up in my gallery as a reminder of these times and to show other cosplayers that we all start somewhere. The dress was a XL Nurse Uniform shirt that I altered to fit me. It was a bit to short, but I wore shorts under it. I burned the edges and stained it with tea and a number of other things for the dried blood splatter. I would never recommend fake blood again. It doesn’t look like blood, it looks like Kool-Aid stains… The make up is Skin Wax and few different bruise wheels and other Ben-Nye shades that came in my Theatrical Makeup kit. The gun was altered with miniature paints and the hat was made completely randomly without a tutorial and some trial and error. The wig was given to me by a friend.